As a father, I have a desire to teach, provide for and protect my children. For me, one way to do all three of these is to choose organic foods for my family. I now know this as a physician, but I first learned it as a father and a husband. That’s often the way it is. Medical textbooks don’t contain all the answers. Intuition and personal experiences often pave the way for later scientific understanding. Today there is a strong, mounting body of science that is illuminating the benefits of growing crops organically. There is also evidence showing the harm of certain chemicals used in foods. And where we just don’t know the effects of new chemicals, we can proceed with precaution and protection for our children and their world. But I didn’t always feel this way. When my first son was born, I was still in medical school. His knowledge of food came from what we fed him and what he saw us eat. Children learn more from what we do than from what we say. As a busy medical student, intern and then resident, I ate a typical rushed American diet: convenience foods, fast foods, junk foods. I ate some fruit most days and even less in the way of vegetables. I was more interested in nutrition than my peers and went out of my way to take additional nutrition courses to supplement the meager offerings in the core curriculum. Still, I knew little. And what I did know was pushed aside by habit and a busy schedule. Crashing Insight When my youngest was a baby, my wife, Cheryl, was radiant and full of life. We were enjoying parenting and working together. Life was great! Then Cheryl was diagnosed with stage III, high-risk, inflammatory breast cancer. The prognosis was grim. She was not expected to live to see the New Year. I grappled with the question “Where does breast cancer come from?” Like so many women with breast cancer, Cheryl had no history of the disease in her family. But she grew up on a farm. It turns out that even though farmers in the United States are healthier than the general population in many ways, they have higher rates than the American public at large for several cancers, including leukemias, lymphomas, myelomas, brain cancers, and cancers of the lip, stomach, skin and prostate. But it’s not just the farmers themselves who get sick. Their children also have higher rates of reproductive tumors, leukemias and brain cancers—kidney and bone cancers, too. As a girl, Cheryl could hear the pesticide sprayers rumble as she lay in her bed. She drank water from a well on the farm, a water source we later learned had been contaminated with pesticides. She bathed in this water. Her family cooked with it. Several lines of reasoning suggest that agricultural pesticides used on farms are partly responsible for the increased cancer rates we see in farm families . The structure and function of these chemicals, their effects on animals and what we are learning about their effects on people are all reasons for concern. The first studies I read about pesticides and breast cancer were a startling wake-up call for me . If these chemicals are hurting people and animals on the farm, how might they be harming the rest of us? Why wait for science to answer this question? The enormity of what we still don’t know about their effects demands thoughtful choices. Against all odds, Cheryl survived her cancer. Did her early toxic pesticide exposure cause her cancer? I don’t know for sure, but I do know that I don’t want our children and other children put at this risk. A Father’s Protection Most children today don’t grow up on farms. Does choosing organic food make a difference for them? Researchers at the Department of Environmental Health in the School of Public Health and Community Medicine at the University of Washington started tackling this question by measuring pesticide levels in urine samples from preschool children in suburban Seattle. They divided the children into two groups: those who were fed mostly conventional foods and those who were fed mostly organic foods. The urine samples of children who ate what people call conventional diets had mean pesticide concentrations about nine times higher than did those of children who ate organic! 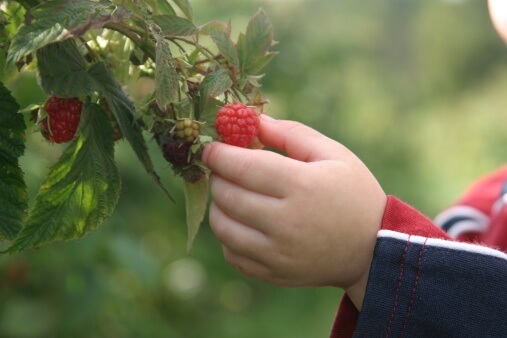 The results indicated that these preschool kids had exceeded the safe pesticide exposure levels set by the EPA and that their health was at increased risk. By contrast, those children who ate organic foods were well below the EPA levels deemed to cause negligible risk. By feeding your family organic foods, you safeguard them from harm and help them build healthy bodies. Choosing organic for my family is one way I protect it. Additionally, when we provide our children with organic foods, we are often giving them an even bigger edge—like organic blueberries instead of partially hydrogenated snacks or organic orange juice instead of high-fructose sodas. What a gift! What an important part of our responsibility!